I began carrying the Glock on July 4th as planned. Interestingly, the first reaction I had to my open carry campaign this past week occurred while I was still carrying the Makarov. The occasion was a meeting of a group of robotics enthusiasts at the Monroe Co. Public Library to which my next-door neighbor had invited me. My 9-year-old daughter Liana and I like to watch both "Battlebots" on Comedy Central and "Robotica" on The Learning Channel, so naturally I brought her along with me. Part of the reason my neighbor wanted me to come to the meeting was that the robotics club seemed largely unable to recruit and/or retain members. He thought I could offer suggestions on how to get things organized. When I showed up with Liana, the only person there was the president of the organization. We knew each other, having been introduced some months previously at the inaugural meeting. While waiting for other people to arrive, we chatted about the small robots that were displayed on the conference table and, in very general terms, what the goals of the organization were. Eventually my neighbor appeared and the president did a brief presentation about programming robots. Programming concepts are not completely alien to Liana. I had given her an introduction to Boolean algebra (she even derived DeMorgan's Theorem) a few months ago using the expedient of a simulation I was working on and enticing Liana to help me out with it. With a little outside prompting and comment from me, I was able to get the president to explain things in a way that would be useful to Liana. With further prompting, I got the president to show her how the program related to the functioning of the actual robot. A little later an I.U. computer science student showed up and he, my neighbor, and I talked about organizational matters and the sorts of future activities the club could sponsor that would generate some interest. Meanwhile, the president was showing Liana how to program the robot. After a half hour or so had elapsed, a father and son came in. The boy was about Liana's age and I suggested that he might want to go over and join Liana for the robot programming tutorial. In all the time I was there, no one commented on the fact that I was carrying the Makarov - my neighbor certainly knew all about it and the I.U. student was sitting next to me on my holster side. In retrospect, some rather bizarre behavior on the part of the president indicates that he was immediately uncomfortable. Right after my neighbor showed up, the president said he had another appointment and was going to have to leave. As I got him involved in instructing Liana, the other appointment faded into the background. I now think the appointment was just an excuse to leave. At no time did he ever indicate any concerns he might have to me. 2: All members are required to act in a matter respectful to other members. 3: THE Bloomington Robotics Society is strictly non-political. 4: The meeting place determines all general behavioral policies determined by the Monroe County Library, and or Indiana University must be strictly followed. While I defend your right to exclude anyone from your club for any reason, please do me the favor of going to my website at www.paulhager.org and reading the 1st 5 articles (I'd encourage you to read the other articles in order as well). After you've done that, let's talk. not against your right to own or carry a firearm. I just think it is not an appropriate place to have firearm, in a scientific arena to exchange ideas. With children and families, in a public library. In my response, I reiterated my request that he read 1-5. Because he seemed to have problems with kids being around guns, I added 16 (Kids, guns, and responsibillity) to the request. Thus far, we've had no further communication. This encounter is instructive because it comes from someone who says he isn't hostile to the right of self-defense. He just thinks you should never exercise the right around kids or families (especially your own, apparently, since Liana was the only kid present for most of the meeting). Even worse is the attitude that you shouldn't be able to defend yourself when talking about science. I wonder what scientist, political philosopher, and politician Thomas Jefferson would have made of that, since he liked carrying a brace of pistols wherever he went. The movie Gentlemen's Agreement, whose subject is ostensibly anti-Semitism, is actually a brilliant exposition of the whole spectrum of prejudice in general. The prejudice of Nazis or the KKK against Jews is easy to discern. But there are more subtle forms of prejudice, as the movie demonstrates. There is the quiet prejudice of "restricting" - not allowing Jews to patronize a hotel or join a country club, though the policy itself is never spelled out, merely "understood". There is the prejudice of stereotyping by people who would claim that they are not anti-Semitic ("some of my best friends are Jews"). There is the prejudice that blames Jews for "rocking the boat" or being "pushy" when they try to fit in to the dominant society ("it just makes everyone uncomfortable"). The president of the club is prejudiced. He had no trouble being around me the first time we met, when I was carrying the Glock concealed. I didn't change in the intervening months. What changed was that he was presented with the opportunity to express his prejudice that there was something unseemly about children being around guns: "Why, they'll pick them up and get killed." If he is exposed to more people walking around Bloomington with their kids while carrying openly odds are he will become de-sensitized and eventually lose his prejudice. Unfortunately, no one else in town has yet joined me in my campaign. Apropos of children and guns, this week I began to give Liana some instruction on rendering a semi-auto pistol safe and also on how to load one. This is in preparation to taking her shooting for the first time, which I'll be doing in a couple of weeks. I used my wife's Glock 19 and a bunch of 9mm snap caps (made out of brass and plastic), which simulate live ammunition. At age 9, it takes most of her strength to rack the slide. As I expected, when I gave her the Makarov, the action was so stiff that she was unable to work it. In my view, semi-autos tend to be better for home defense than revolvers because it requires an amount of strength to load a semi-auto that really young kids don't have. Revolvers take almost no strength to load. At the same time, an adult can take the gun from a safe state to a ready state in a second or two (much faster than with a revolver), which could be a matter of life or death in a home invasion scenario. By the time a kid is old enough to actually use the gun (around 8) (s)he is old enough to learn responsible behavior around guns. This is not to denigrate revolvers, by any means. Obviously, there have been revolvers in American homes for over 150 years, and the overwhelming majority of parents have been successfully teaching their kids to be responsible around guns for that entire period. However, I think that arguably, having a revolver requires earlier instruction than would be the case with a semi-auto. My July 4th activities began with our neighborhood's annual Independence Day parade. The parade consists of kids riding decorated bicycles or sitting in wagons pulled by parents or older siblings. There are usually a couple of cars festooned with bunting in patriotic colors. On this day, the portable tape player, which performs in lieu of a marching band, was on the fritz, so there was no "Stars and Stripes Forever" for accompaniment. My oldest daughter was in the parade. My wife, youngest daughter and I watched from our driveway. The parade always ends near the entrance of our subdivision and then the participants and parade watchers all head over to the park for desserts and drinks. Our family reunited at the park and we commenced socializing. The guest column I wrote for the Herald-Times didn't appear until the 5th, so no one in the neighborhood knew anything about my intention to start carrying my Glock. In the event, no one seemed the least bit concerned or otherwise reacted negatively. I did end up getting into a political discussion with one of my neighbors, but it was about my run for Secretary of State. We talked at some length about a voting reform I will be promoting as part of my platform. It's called Approval Voting (AV). My neighbor was familiar with AV because an article about it had appeared a couple of months ago in Science magazine (he later sent me a copy of the article). For my public appearances on the 4th, I elected to wear my Gadsden Flag t-shirt, which has the flag's image of a coiled rattlesnake surrounded by the words, "Don't tread on me". The Gadsden flag really was the flag of the American Revolution. It was much more evocative of the libertarian spirit that animated the Revolution than the Stars and Stripes flag that was officially adopted later. The rattlesnake is indigenous to North America and is shy and retiring, and will avoid a threat if at all possible. Bother it, however, and it coils and sounds its rattle - an ominous warning that it wants to be left alone. Persist and it strikes with deadly speed. "Don't tread on me" also expresses the basic philosophy of self-defense. Like the rattlesnake you avoid conflict; you retire if possible. Only after all alternatives have been exhausted do you strike to protect your life, or the lives of your loved ones. We arrived at the marshalling area for the parade and I quickly found where the Libertarians were supposed to congregate, but no one was there. We were early, so I figured I'd wander around with the girls and do a little socializing with the other participants. I almost immediately saw Steve Sharp, the Monroe County Sheriff, heading in our general direction. I yelled out, "Steve!" to get his attention. He came over and we exchanged pleasantries and I introduced him to my daughters. Steve is an ex-Green Beret officer who served in Vietnam. He was a Bloomington police officer for a number of years and eventually rose to Chief of Police. He was replaced after a change of city administration and he later ran for and won the position of County Sheriff. Steve and I have been on pretty good terms ever since we were paired against each other in a debate on drug legalization about 8 or 9 years ago sponsored by the I.U. Journalism Department. It was probably the most decorous and polite debate I've ever been in. A photographer from the Herald-Times came by to take my picture. He later snapped some pictures of me once the parade was underway. I had been told that my column was to appear the next day so I figured the picture was intended for that. One of his pictures was in the Herald-Times but it accompanied an editorial that appeared July 6th. I'll have more to say about that editorial later. Right next to us in the marshalling area was a convertible in which Bloomington Mayor John Fernandez was going to be riding. He was there with a number of people, most of whom I didn't recognize. I had never met Fernandez, but I figured that because we were both running for Secretary of State (he's seeking the Democratic nomination and is currently unopposed) I should go over and introduce myself. One of the people I didn't recognize turned out to be Joe Kernan, the Lt. Governor. After the obligator political badinage I rejoined the Libertarians. Once the parade began I found that the response of the onlookers was pretty good. In my estimation, there was a little more approval directed toward us than in the past. A lot of people gave me the thumbs-up sign along the route. There were no signs of disapprobation directed toward me. I was at the party for around 3 hours and in all that time, there was only one comment directly related to my carrying the Glock. Someone asked me if I was "expecting trouble" or words to that effect. I gave him a very brief explanation and one of my cards. The only other discussion of carry that I participated in was at my instigation. I met a fellow who was an Israeli-American dual citizen. After covering a wide variety of topics, I asked him about civilian carry in Israel. He responded that it was common and wasn't something he thought about a lot. He did know that the government gave Uzis to settlers for self-defense. I have to mention one thing that happened at the party. Margaret and several of her friends are devotees of belly dancing, and no party of hers is complete without an exhibition of the art form. We were all invited to participate in a patriotic belly dance to "Stars and Stripes Forever". I'm a confirmed non-dancer, but Margaret got some sort of diaphanous shawl and tied it onto my holster. So, I improvised a bizarre half-march half-dance to John Phillip Souza for the edification of the party goers. 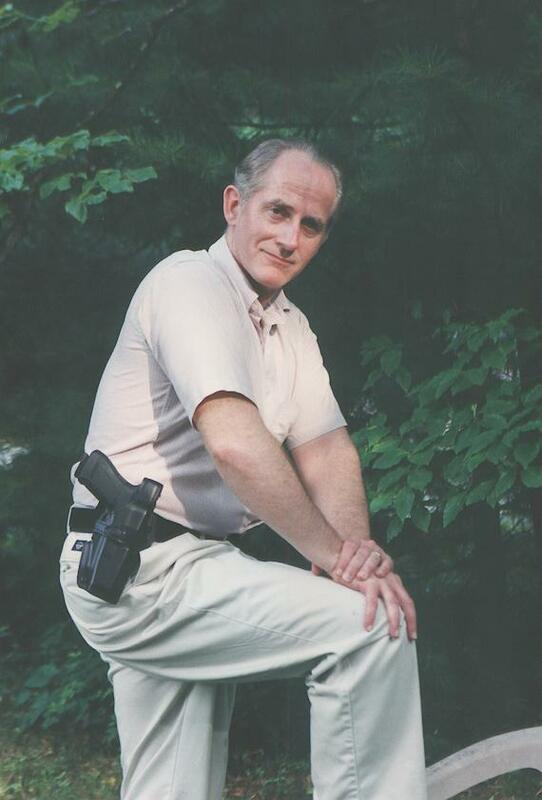 Local Libertarian Paul Hager has stepped up the arms race. It seems not enough notice was being made of his puny little gun. He's got a bigger one. He's carrying a Glock on his hip now, a semi-automatic that fires as rapidly as you pull the trigger. That little popgun he had been carrying wasn't attracting enough attention to his point that his right to carry is guaranteed by the Constitution. This new weapon is one carried by the police - and no doubt by a few lucky bad guys who manage to steal or afford one. Eventually, whatever shock value the Glock has will wear down. Its bang will be reduced to a pop that no longer makes a big enough point. We predict more escalation. Why not an M-16 next? A little awkward, but OK slung over the shoulder. Then perhaps a .50 cal. machine gun. Of course, Paul will have to apply for a federal license for that, something with which a Libertarian might not be comfortable. Can there be an end in sight? Perhaps that will be after the tactical nuclear weapon stage - cumbersome, certainly, but such weaponry is definitely classed as arms, right? I wrote this letter in response. If the Herald-Times were being fair, the title of my column would not have been changed to "Libertarian takes gun statement to another level with a bigger pistol" from my original Defending the right of self-defense. The title change increased the likelihood of cognitive dissonance on the part of readers. Also the editor should have visited this website before writing something that completely mischaracterized what my campaign is about. "Thus far, I've generated very little attention, either negative or positive. As I stated on the website when I began this campaign, I started with the Makarov in order to establish a baseline response. Now I'm ready to shift to a gun that is larger and harder to overlook: a .45 caliber Glock 21 semi-auto. This will allow me to determine whether changing to a more obtrusive gun affects the way people respond." "Thus far, I've generated very little attention, either negative or positive. Though this is the desired response, it's important to know if no reaction means that people accept open carry or no reaction means they are unaware I'm carrying because the gun is small and completely enclosed by the holster." There might have been less room for misinterpretation. There is a view, which has some credibility, that there is no such thing as bad press. The Herald-Times gave my campaign more exposure (albeit negative) than I was expecting. It may not be a bad thing, in the long run.